The Bellevue College Board of Trustees announced Wednesday that they have voted to select Dr. Jerry Weber as the next president of Bellevue College, making him the sixth president in the institution’s 50-year history. 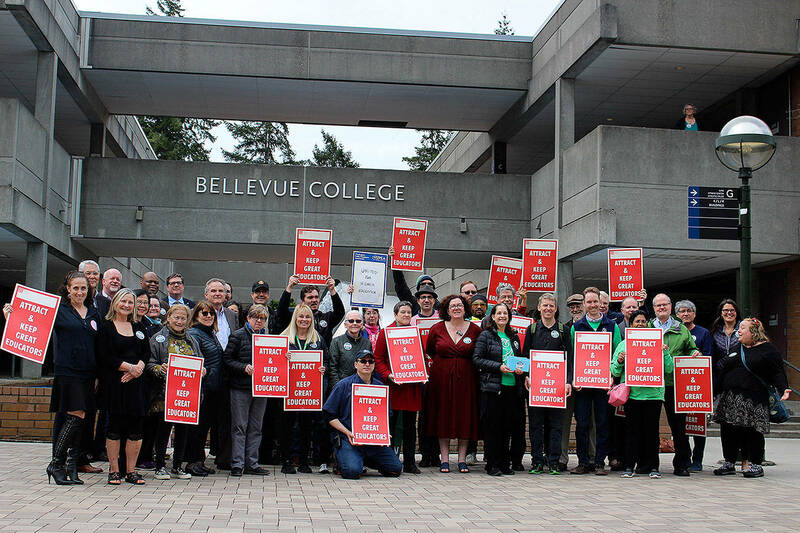 Bellevue College is the third-largest institution of higher education and the largest community college in the state with over 30,000 students enrolled annually. It offers a comprehensive array of programs including 12 bachelor’s degrees, four transfer associate degrees, 23 professional-technical degrees, 67 certificates and 20 noncredit programs. New additions to the baccalaureate programs include a Bachelor of Science in computer science and Bachelor of Applied Science in digital marketing. The college is also the source of more transfer students to Washington’s public four-year colleges and universities than any other community or technical college in the state. Weber said he wasn’t familiar with all the challenges Bellevue College faced, but was prepared to quickly get up to speed. Dr. Weber was selected as president of the College of Lake County in April 2009. Previously, he served as president of Kankakee Community College. He has held positions spanning from English faculty through vice president of instruction and student services. He said that all colleges have to deal with budgeting and planning issues and Bellevue College is no different. He hopes to use his experience to better Bellevue. “It’s a very dynamic area and a really great institution,” Weber said. Dr. Weber serves on local and regional boards and committees including the Lake County Workforce Development Board, Lake County Community Foundation, Lake County Partners for Economic Development and the Chicago Metropolitan Agency for Planning. He has served on state and national boards and councils for community colleges related to international education, technology, educational policy. and sustainability. He recently was elected by his peers to the Board of Directors of the American Association of Community Colleges. He holds a Ph.D. in higher education administration and a master’s in educational measurement and statistics from the University of Iowa. He has also earned a master’s in linguistics and English literature and a bachelor’s in English from Northern Illinois University. The nationwide search began last August following the resignation of Dr. David L. Rule, who had served the college as president for five years. Dr. Jill Wakefield was appointed interim president not long after, coming out of her retirement as chancellor of the Seattle Colleges. Dr. Wakefield served the district for 40 years, starting out as a program assistant in the veterans office at South Seattle Community College, before moving on to serve as a public information officer, director of development, vice president for institutional advancement and vice president for instruction, as well as president from 2003 to 2008. The search was coordinated by a Presidential Search Advisory Committee comprised of representatives from Bellevue College students, faculty, staff, trustees, foundation and community members, with the assistance of an executive search firm, Gold Hill Associates. Three finalists, including Dr. Weber, were chosen in February. Each visited the campus to participate in open forums, meet with the board of trustees, the president’s cabinet and other campus groups.